I’ve been slack of late, not necessarily in art of cooking but more in remembering to photograph or where I have remembered to photograph I’ve just been lazy in writing things up! Not good! Alhumdulilah, we’ve been fortunate enough to choose a different country to eat from every day this Ramadan and my objective was to share this so inshallah I will start sharing! Last night for iftari we ate Palov from Uzbekistan done earlier (click Uzbekistan on the side – I can’t figure out links!). Actually it was very easy almost too easy! Before Ramadan I had prepared the lamb stock for the palov which meant that with iftari at approximately 8:23 last night the food didn’t actually get on to cook until 8pm! My husband did actually question me a couple of times to make sure I was on schedule. The plus point was that all I had to do was chop carrots, if I had been at work I would have bought pre chopped carrots, but honestly I needed something to do just to pass the time! Once my carrots were chopped perfectly all that remained to do was drain and wash the chick peas, throw in the pre-soaked rice, the mandatory head of garlic and hey presto iftari was done! It was so easy, quick and brilliant for when your head just isn’t functioning. 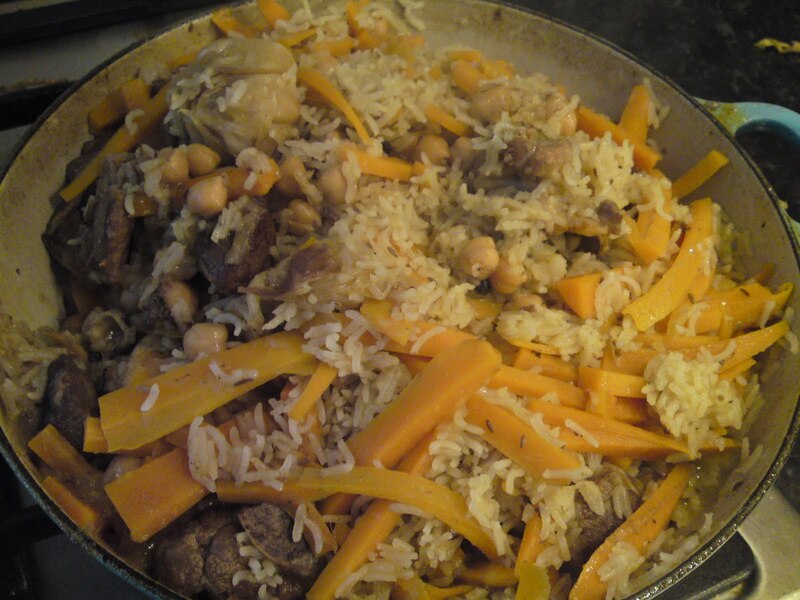 When I first came across a recipe of Uzbek Palov (or Plov) I have to confess that I was a tad if not entirely dubious of its merits. After all the first recipes I found were pretty much meat, onions and carrots. There seemed to be a total lack of warm fragrance that would waft from the similarly named plau that I had grown up with. None the less I rolled up my sleeves and got surfing the internet with the belief that there had to be more to this than meat, onions and carrots. 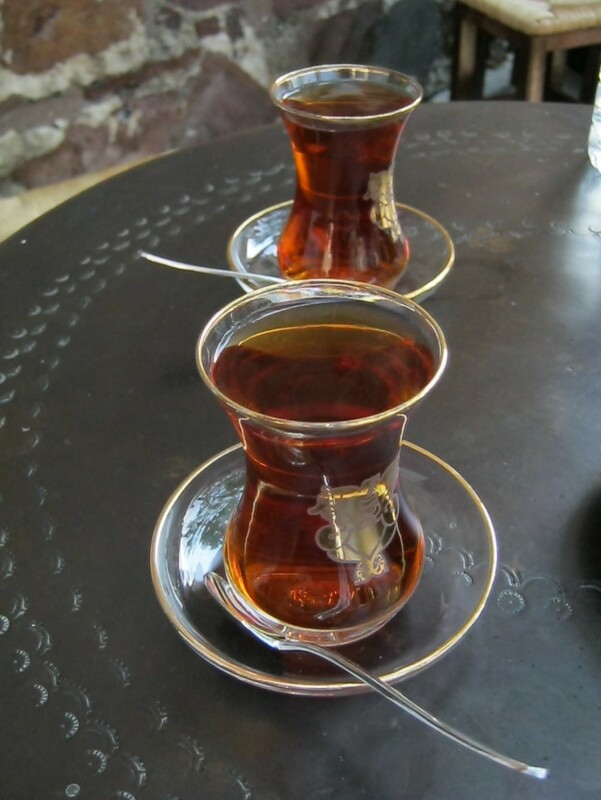 Happily I can inform you that there is, however if you are not careful you can end up with all and sundry in this and some things not for the better – and that is what the Uzbeks say ! I don’t claim that this is a definitive version of Uzbekistan’s national pride, but this palov contains an authentic combination of ingredients that taste sensational. Dried apricot paste, adds a tangy sweetness to the dish that just blends in with the spices. If you are unable to obtain this then dried apricots will do, however their flavours will be localised and it won’t blend with the rest of the spices. This dish does take some work however, as a form of Ramadan preparation I would suggest doing stages 1 to 9 in advance and freezing before the final ingredients. Once the base has been defrosted the only time required is to soak the rice and then to cook the rice. 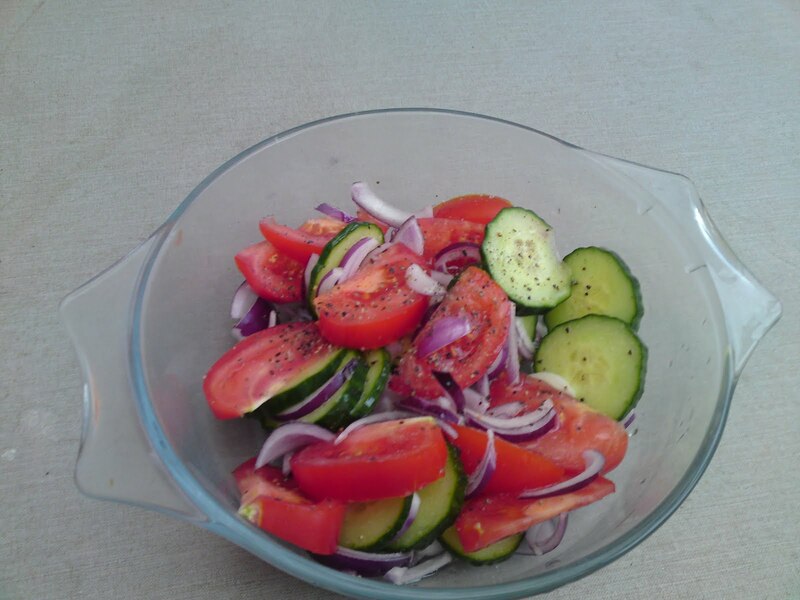 As an accompaniment a simple side salad of cucumber, tomato and onion is all that is required. This dish is substantial enough to not require anything else. 2. Place about 2cms of oil in a heavy based casserole pan and heat the oil until it begins to smoke. Then gently place the meat into the pan and brown the meat. Add in 1 teaspoon of garlic paste, 1 teaspoon of cumin seeds and continue to brown. 3. Once the meat is browned and crispy add the onions, lower the heat and allow them to gently cook until the onions have broken down and are very soft and mushy. 4. Just as the onions begin to caramelise, lower the heat and slowly add in a little water to deglaze the pan. Make sure to rub the caramelised bits off the pan so that they start to form a darker broth. 5. Pour in enough water to completely cover the meat and then add in 1 teaspoon of cumin, 1 teaspoon of salt, 1 teaspoon of pepper corns, 1 teaspoon of coriander seeds, and the dried apricot paste/ dried apricots. 6. Increase the heat to medium and simmer for 5 minutes. 7. Pierce each clove of garlic (leaving the head intact) with a knife to allow the flavour to escape, and then place the garlic head into the pan. 8. Allow the meat to simmer for an hour or until the meat is tender, checking to see if the water needs topping up (the water should fully cover the meat). 9. If preparing in advance, the meat and liquid can now be frozen after leaving to cool. Defrost fully and heat before using and resume at stage 10. 10. Reduce the heat to low. Drain and wash a tin of chickpeas and add to the pan. Add the julienned carrots. 11. Drain the rice and add to the pan. 12. Bring the pan to the boil and bring the heat down to low again. Place the lid on to the pan and cook for 20 mins or until the rice is soft and the liquid has evaporated. Try not to open the lid as the steam will escape. Once the rice is cooked do not stir the rice, gently comb a fork through it. 13. Sprinkle with fresh parsley and serve with the meat and garlic on top with a final sprinkle of parsley on top. 14. Serve with a cucumber, tomato and onion salad. Dress simply with salt, pepper, oil and vinegar. For a meal en famille serve directly from the pot. 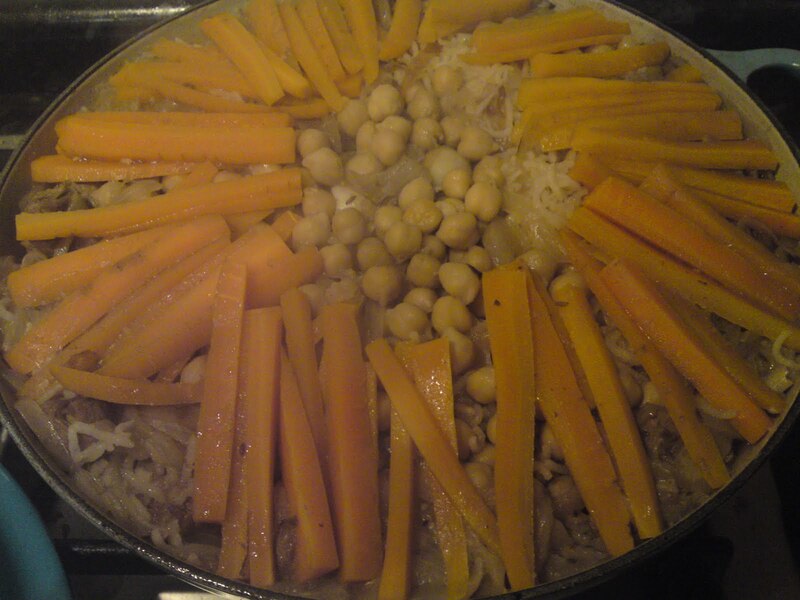 With guests, place the rice at the bottom, and then lay the meat on top of the soft bed of carrots. Place the whole head of garlic on top of the meat and sprinkle with parsley.